Without a doubt, Spigen’s Tough Armor line is the company’s most soundly protective case series – offering quality drop protection without the Otterbox-like bulkiness and expensive cost. We’ve checked it out for numerous smartphones, but in this particular instance, we’re reviewing the one for the iPhone 6. Naturally, Spigen offers a deep selection of cases for the beloved phone, however, if you’re all about protecting the svelte iPhone 6 to its utmost capacity, then the Spigen Tough Armor case might be the one you’ve been looking for. By now, we’re quite familiar with the Tough Armor Series – and the one here for the iPhone 6 doesn’t deviate from the distinct design language we’re familiar with. Visually, it’s not the most appealing in its lineup for the iPhone 6, but it’s absolutely the most rugged out of the bunch. Employing the staple dual layer design, one that consists of an inner matte TPU case and a matte polycarbonate outer frame, the tandem ensures that the _phone_ is soundly protected from drops. Although, the front is left exposed, so it’s still prove to damage in the event it’s dropped at a weird angle. Indeed, the Tough Armor case bulks up the iPhone 6’s size, but it’s not quite as extravagant as some of Otterbox’s cases – so it’s still easy to hold for the most part. Cutouts, of course, are found throughout the case, offering us access to its ports and button. In the rear, too, there’s a circular cutout to keep the Apple logo in plain sight. However, the flush nature of the volume controls make them difficult to differentiate at times. Luckily, though, they’ve made a wide enough cutout for the 3.5mm headset jack – allowing fatter cables to fit properly. Normally stickered with an MSRP of $34.99, you can snag the Spigen Tough Armor case for the iPhone 6 for as low as $18.99 through Amazon – and it’s available in 4 different colors! 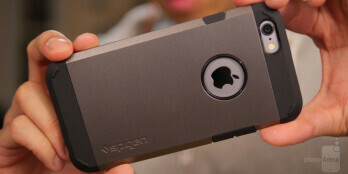 All told, this particular case offers great protection at such a competitive price point. Sure, its design by now isn’t all that new, but regardless, it’s still largely compact enough to comfortably hold.